But the side interest here is literally at the side, a perhaps revealing bit of marginalia in which the copyist has recorded the names of 54 children (I imagine). Are these names the names of classmates, other children in school, kids in town? There are 26 girls and 28 boys; the girls, as it turns out, have 9 different names; the 28 boys have 18 different names. I wonder why? The girls have the following names (and with the number of holders): Ann (7), Ekiza (4), Mary (4), Hannah (3), Sarah (3), Mary (3), Jane (2) and then one each for Lydia, Sidney and Maria. 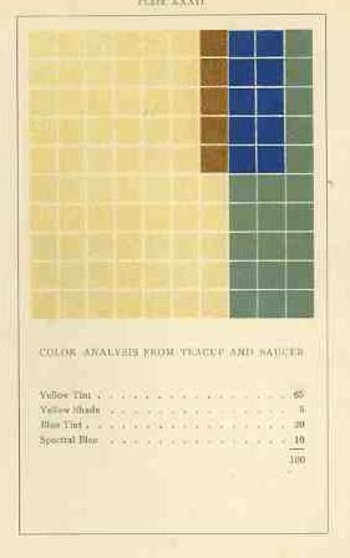 JF Ptak Science Books Post 1939 Part of the series on the History of Blank, Empty and Missing Things. I bumped into a Google search page that was filled with entries for designers and jewelers with business names invoking the Mona Lisa--Mona Lisa Jewelry and so on. This coupling could well be found in the crushed metaphor jar in the back of the refrigerator. One thing is for certain: no doubt the real Mona Lisa had plenty of money (probably the wife of a successful merchant named Francesco de Giocondo) and privilege to afford jewelry, but in the Leonardo's painting she is pictured quite plainly, wearing none. Her hair is also very simply portrayed. This was a rare thing to do in portrait--as a real people who portraits were being made usually wore as much jewelry as they could or in some sensical variation of that. The hair too was a big deal--all you have to do is take a quick survey of hairstyles of Renaissance women in paintings and it will become instantly clear hairstyles were complex and involved. 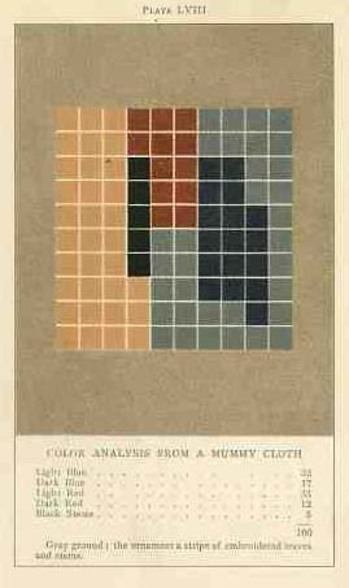 Mona Lisa's dress, too, is very simple--plain even--and in understated, muted color. All of this was exceptionally unusual for the time. There's not a speck of jewelry on the Mona Lisa, and her hair is simply parted, falling to her shoulders. Maybe Leonardo didn't want anything in the painting to fix it at any specific point in time, as the whole entity seems to be in a state of suspended completion, or complete but not quite there, still becoming something. Perhaps highly defined hair and jewelry on her fingers would have been unacceptable anchors, giving places for the eyes to land and move away from the lush layers of light and tone that give the painting some of its enormous "motion". So in the history of missing things, or of missing jewelry and finery, the Mona Lisa must rank pretty high. It was just unusual to think of a business name invoking the antithesis of what the business is about. The Mona Lisa of course became one of the most famous missing things in the history of missing things when she was stolen by the not-very-bright Vincenzo Peruggia in 1911, but that's another story (and one which I talk a little about in the post The Most Famous Missing Doorknob in the History of Art). Pierre Gassendi (1592-1655) published this God's-eye-view of creation a few years after his death in the fourth volume (Astronomica) of his six-volume Opera Omina. His friends and supporters of course saw to the publication of this mathematician/philosopher/logician's work1 back there in 1658, so Gassendi--a very prominent thinker from a long-line of thinkers nearly on the verge of great discovery here and there and certainly a witness to it--made his greatest adventure in publishing only in death. The eye of god is also not very uncommon, and is represented by an eye and also in a sacred triangle. Less common though are images like Gassendi's, which in a way, in an odd and almost offhand way, give the reader a sense of what it is that god might be seeing in agodly-lineof-sight Perhaps this is incorrect--but in judging his image with others in my experience it seems to me that the representation is a little more "personalized" here than just about anywhere else. A while ago I wrote a post on Herman Soergel's plan for extending the landmass of the countries around the Mediterranean Sea by damming the straits of Gibraltar, lowering the sea and irrigating the Sahara--an original, interesting but not very good idea, filled with briney cultivation and racial politics. 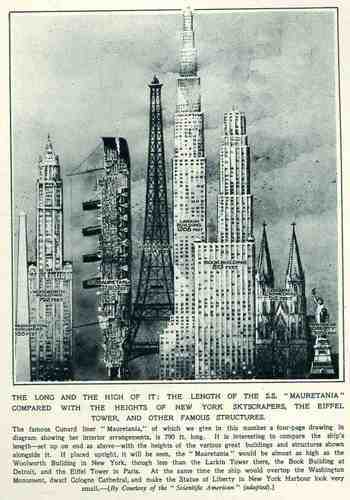 In the past on this blog I've written about other city plans--and in particular, for New York City--that have involved floating Manhattan into the harbor, or filling up large chunks of the Narrows, or floating the city on an enormous anti-gravity platform, and so on. Some of those plans were real, some science fiction, and some were plainly beyond both. The plan presented above is another monster, but at least this one could work, if not for the doing of it, and the expense. And the will. But the bottom line, according to the engineer doing the thinking on this project, Kennard Thomson, would supposedly net the city a cool billion dollars after everything was said and done, and that would be 1916 dollars--that was equal to about 5% of the American GDP (!) in 1916, which would be about $400 billion in terms of 2010 GDP. I'm not sure how Thomson came up with this very big/very round number, though it must have been done for effect--I can just imagine him standing before a smokey room filled with civil engineers talking about his massive plan for enlarging NYC and throwing out the billion-dollar figure, watching the cigars glow red in exhaled disbelief. Thomson did know what he was talking about--he was a busy (and "leading" according to the NYT) Manhattan civil engineer of stature, working on the Canal Barge and being the principal engineer for the Municipal and Singer buildings, for example--and his project seems to be well within the scope of possibility. Their sensical aspects however are, well, questionable. Here's the story--around 1911, while examining proposals to repair and extend New York's wharves, Thomson came upon the idea--a magnificent, fabulous idea--of adding new wharves by adding new lands to the city. In short, the overall plan was to fill in the East River (!!) and reclaim the new land for city living, dam Hell Gate, construct a New East River (from Flushing to Jamaica Bay), extend the tip of Manhattan Island from the Battery to within a quarter-mile of Staten Island (! ), create a new 40-square-mile island between Sandy Hook and Staten Island, extend the Jersey shoreline, add two new Manhattan-sized appendages to the east shore of Staten Island, and more. All of this would be connected by various new bridges and roads and tunnels, as well as a 6-track elevated railway that would circumnavigate the city. The purpose of all of this would be to add 100 miles of new docks, an enormous amount ("50 square miles of reclaimed land") of new land and the capacity for NYC to house 20+ million people, all of which would be worth a billion dollars. Thomson really meant "really" in the title for the proposal. There have been reclamation projects undertaken in New York Bay since then of course, and I think that virtually all of what Thomson talked about could be done. I think it would be a very interesting project for a class of some sort to undertake an estimation of what such a thing would cost today (and I would guess to duplicate the idea in real terms now would take up a sizable chunk of the GDP). Maybe all of this will make sense at some more future point. 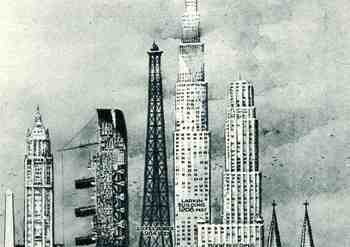 And along this line of thinking I include a very interesting drawing made by architect Lebbeus Woods, showing the bedrock part of Manhattan. He empties the East River and damns (?) the Hudson, and also builds some new port extending from Staten Island or out from Jersey...but the effect of the dry river bed between Manhattan and Brooklyn. Andthen some--he empties the river, and then deepens/excavates, heightening the depths (?!) of Manhattan Canyon. The depth of the river where we can see it in the drawing is maybe 100 feet, and certainly (judging the depth against the heights of the structures in the lower island) the canyon is deeper than that--maybe an order of magnitude deeper. --A good read on Thomson and Woods can be found here, at Telemachus Untitled. 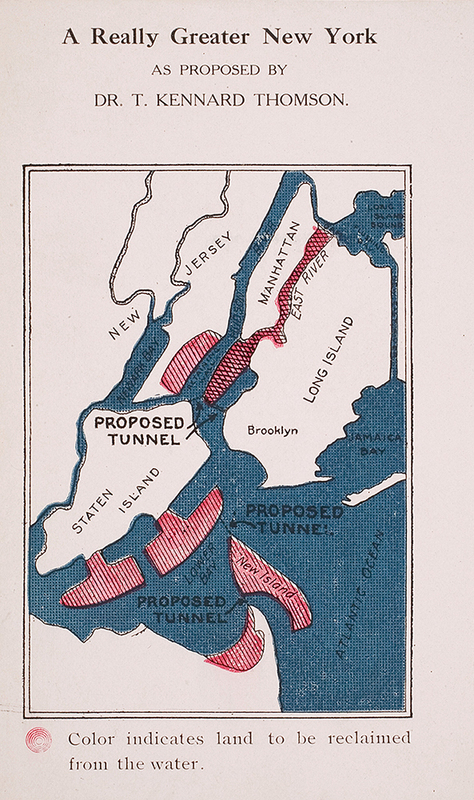 --A contemporary NY Times article on the Plan can be seen here and another (with illustrations) from 1913 here ("Plan to Fill in East River to Solve Port Problems"). 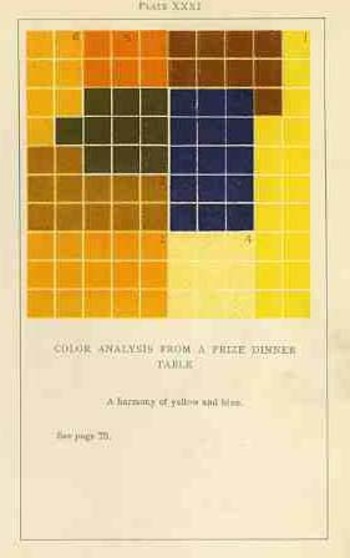 --Another treatment of the whole idea can be seen at Frank Jacob's great Strange Maps blog, here. Colbert de Lostelneau's (French Marshall and Commander of the French Royal Guards) Le mareschal de bataille...1and printed by Estienne Mignon in Paris inthe year 1647, is one of the earliest books to be printed in colros. This rare book, which was a superior cummulative work on tactics and strategy and military thought (and which in parts leaned very heavily on earlier and sometimes unattributed books), employed the new venue of color printing to highlight its musketeers/pikemen/cavalry symbols in three shapes and in three colors for easier understanding of the movement of three different aspects of an army. It is said that in this way the military theory was made more adaptable and practicable. 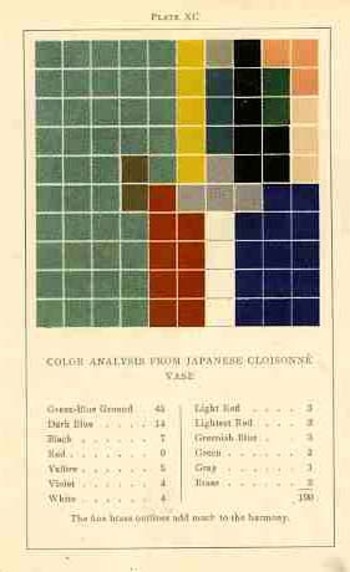 In the history of dots, though, these color-printed varieties are significant as being among the first of their kind. Tony Soprano may have been a murdering and lecherous crook, but the man was always on hand with a handkerchief if a sobbing woman needed one. They were washed and ironed and folded by the wife he would cheat on, and he'd dab his brow from murderous sweat with it, but, well, he had one when it was needed. Few people carry one around, nowadays, and very few people manufacture them, at least here in the U.S., let alone in NYC, the place opposite Tony's Exit 13. The Gold Book Directory of Men's Apparel ("published by Men's Apparel reporter") was issued for the World's Fair in 1939--it is a stubby, 320-page, 5-inch-tall and designed booklet, and it is pretty much a mausoleum-y reminder of what once was. New York had been a center of clothing manufacturing for a long time, and this pamphlet reminds us of that--and I'm not getting too rosey and sentimental about a tough trade that had its share of abuse of the unprotected, as there were generations of immigrants who passed through those sweat-box meat grinders choking out pants and shirts for the lower- and middle-class while making pennies-per-piece. The shirt-pocket-sized golden book does remind us of industry that once was, and now moved overseas to perhaps even more vast abusing sweatboxes to produce cheap goods at clothing prices lower than they were (CPI-adjusted) in 1939. It is striking to see the tabbed division headings: "New York Hat and Cap Manufacturers" (listing 100+ businesses), "New York Handkerchief Makers"(60+! ), robes (60), shirts (300), underwear (250), robes (90), evening dress (100), waistcoat (50), cumberbunds (24), label makers (woven (! )75), and of course New York Pajama Manufacturers, weighing in (with a line of pj's called "Mr. Stubb" for "the short man") with more than 120 manufacturers. It is really enough to make the modern reader misty for lost times. 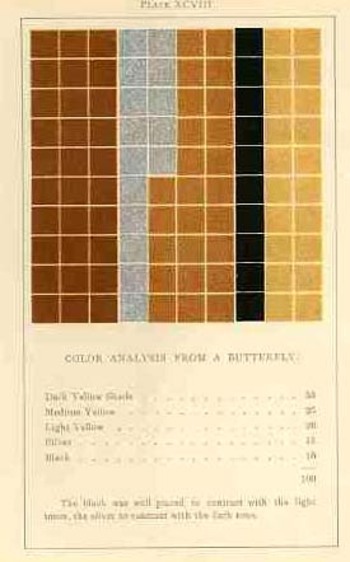 Now, these categories were not mutually exclusive, and the Zenith Underwear Company could also produce handkerchiefs, but there is ample evidence here of vastly lost and different times--not only in the loss of domestic manufacturing, but also in the disappearance of the need for evening dresses, cumberbunds, waistcoats and (almost-but-not-quite) handkerchiefs. Below you can see the detail of the man at the middle right--he is absolutely pointing to teh tree, perhaps sharing his amazement with the man and child coming down the street. The pointer had been seated, probably, on the bench behind the bar that was in front of the bar/saloon/draughthouse that he was probably inside of, perhaps enjoying a pint of five, perhaps making the tree even more amusing than it was. (The tilted stein is clearly visible advertising a place for thirsts to stop.) The child is reacting to something, and even so the dogs--the second of which seems to be stopped mid-stride in amazement. I’m fond of images of trees, but mostly if they are forensic or employed to display relationships between ideas or data. One of my favorites for the former is this great image from Peter Guillet’s Timber Merchant's Guide. Also, a Table, Whereby, at One View, May Be Seen the Solid and Superficial Measure of Any Square or Unequal Hewed Logs or Plank...1 (printed in Baltimore by J. Longrove in 1823). Guillet was basically a tree dissector, a harvester of wood for the construction of naval ships. His book shows how to make the best—the most efficient—use of various varieties of trees, displaying how to employ different sections of trees for different parts of a ship. The book must’ve been an indispensable handbook down at the mill. At the every least, it certainly introduced a novel way of looking at trees. This tree2 was a figure drawn by biologist and eminent Darwinian Ernst Haeckel3 (1834-1919), the branch spaces relating to intervals which were unrepresented in the fossil record. The image was perhaps the most popularly successful part of his two-volume double-wristbender—it was a difficult book, not well written or presented, with Charles Darwin himself finding it “impossible to read”. The second tree, offered by Haeckel in his The Evolution of Man (1879): shows the general evolutionary progress of living things culminating in man, the hopeful and suspected end (or height, or crowning achievement) of the process of evolution. Which is a little odd, come to think of it, to have there be nothing above man, not even a space for unimaginable improvement, not even a single unused branch to express the possibility of supra-human development. The Verkaufsvereinigung fuer Teererzeugnisse (of Essen) used this idea in 1922, publishing the ad for their company in the Illusrtriete Zeitung (Leipzig). The great tree spring from a bed of coal (“kohle”) exhibiting the “stammbaum der nebenerzeugnisse” (roughly the “pedigree of our product”), with the trunk being gas, branching out into tar, coke and cyan and so on. Even though it’s the lifeblood of the continuing industrial revolution, and even though we’re hundreds of years into a deep need with the products, the use of the tree just seems antithetical to it all on all levels of recognition, especially now. Then of course there's the Darwin tree, an incredible diagram from his notebooks, prefaced with the extraordinary understatement, "I think". There will be more of these tree to come, shortly, including a tree of dermatological disease and some Kabbalisitc trees of life, but they'll have to wait for right now. 1. The full title, as follows: Timber Merchants’ Guide. Also, a table, whereby, at one view, may be seen the solid and superficial measure of any square or unequal hewed logs or plank, from one to forty-seven inches. Also, plates representing the figures of the principal pieces of timber, used in building a seventy-four gun ship of the line, in standing trees. "Individuals wishing to make the most of their woodlands will find it very profitable to cut their timber by sections, sparing to very acre ten or twelve of the most promising size white oaks or pines, whichsoever the soil will produce best; range the order of their lands so as to cut a section every year. For example, say a man has 200 acres of woodland divided into sections of 10 acres each, then, by cutting one section every year, he would have young timber twenty years old, which makes excellent firewood, and I should say that in common lands wood of twenty years' growth would yield 15 or 20 cords of firewood per acre, besides fencing-timbor sufficient to always keep in good repair an inclosure of 200 acres. Then the 10 or 12 trees growing in reserve will, at the end of 80 or 100 years, furnish timber fit to make shipping or staves. Where land has become useless from long cultivation, a little trouble only is necessary to make it productive and profitable to the owner. By inclosing it for a few years and encouraging the growth of the most promising younj* trees, which will generally spring np spontaneously, all the advantages above described will be derived from it, which is certainly the best way that worn-out or sterile land can be disposed of. Such a course recommended to and adopted by individuals wonld not only be to their own private gain, but also of great public utility." 2. “Monophyletischer Stambaum der Organismen” from 'Generelle Morphologie der Organismen' (1866). 4. Explanation of the second diagram, as follows from Discover Life: "Phylogeny is the organizing principle of modern biological taxonomy, and a guiding principle of modern phylogeny is monophyly: a monophyletic group is considered to be one that contains an ancestral lineage and all of its descendants. Any such a group can be extracted from a phylogenetic tree with a single cut. The tree shown here provides a guide to the relationships among the major groups of the extant (living) organisms in the Tree of Life as we have presented them throughout this book. We do include three groups that are not believed to be monophyletic; these are designated with quotation marks.” See also HERE for a different view of this diagram. This is a quick addition to the Extra-Earth category of this blog--and an amazing one. In the other examples the extra-Earths appear simply appear , with little or no interaction between the two. In this instance we have one Earth attacking the other. There is no necessity for this to make much or any sense, what with the purple sky and, of course, the extra-Earth--but the attacking rocket taking off from the extra-Earth extra-Florida (or thereabouts) seems to grow in size as it gets closer to its target. After all, the attacking extra-Earth is less than 300' away from what has become an enormous and marauding space vehicle (judging from the distances in relation to the buildings) which is now longer than the extra-Earth-America is wide. But in the world where a miniature extra-Earth can attack a standard-sized-Earth, this would be a minor quibble. Honestly, I think I like to write about such things for the joy in having to think of a title for the post.